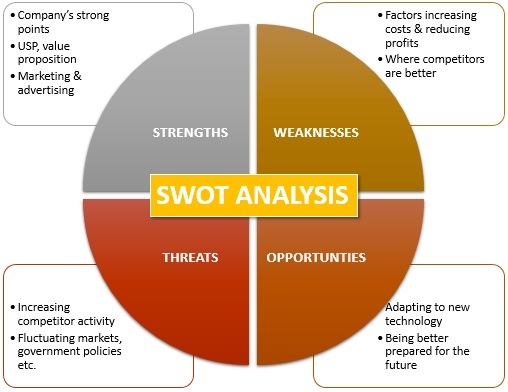 Get Your Dental Business and Marketing Strategy Right – Start with the SWOT analysis. Information about both the external environment and your organisation’s internal capabilities is crucial to informing your goals and strategy and making the right business decisions for your practice. If you are at the helm of a dental practice start-up or run an established business it is essential to identify the strengths, weaknesses, opportunities, and threats (SWOT) to your business. A good starting point is an assessment of what a dental practice does well and what it does less well. In general good strategies take advantage of strengths and minimize the disadvantages posed by weaknesses. These are internal environmental characteristics of a business and help assess business capabilities internally. An example of strength may be the unique selling proposition of your practice such as extended hours offering flexibility or payment plans with no interest, increasing reach and affordability of your services. An example of weakness may be inadequate staffing, training or equipment available to grow the business. Opportunities assess the external positive factors that represent the reason for a business to exist and prosper. These are external to the business. What opportunities exist in its market, or in the environment, from which the dental practice will benefit? An example of opportunity could be to respond to market forces and start to offer virtual dental appointments via tele-dentistry (e.g. via Dental Monitoring) or create more brand awareness to increase your market penetration and share. Change in demographics, economy and attitudes can also be a potential opportunity to grow and develop your practice. Threats include factors beyond your control that could place the strategy, or the business, at risk. A competitor starting a new business and offering more value in response to the customers needs in order to satisfy their needs. Increase in costs of dental supplies or lack of supplies could also be a potential threat that could affect your business. An economic downturn is another area of threat leading to reduced spending by the consumer for their health care. Its is important to be aware of all potential threats that are realistic and know then year-by-year. 1. Strengths and Opportunities (SO)—How can you use your strengths to take advantage of the opportunities? 2. Strengths and Threats (ST)—How can you take advantage of your strengths to avoid real and potential threats? 3. Weaknesses and Opportunities (WO)—How can you use your opportunities to overcome the weaknesses you are experiencing? 4. Weaknesses and Threats (WT)—How can you minimise your weaknesses and avoid threats? You will be surprised how much this exercise will help you identify your key strengths and where to go next in your business. For practice sales, this is a useful exercise as well – giving the buyer a nice overview of current and future directions. It will help you formulate your Unique Selling/Service Proposition and why should the customer choose you! Good luck and make this a team activity!